• هناك 117 غرفة و 29 جناحا. Mayfairيقع في وسط مدينة لندن التاريخية في حي مايفير. ألبيمارليAlbemarle الشارع السلمي المبني في القرن 18. • 1837: Foundation of the Brown’s Hotel by James and Sarah Brown. James Brown was a former valet to Lord Byron. • 1859: The Hotel is bought by James John Ford. • 1860: An elevator gets added to the Hotel, something unusual for the time. • 1871: The exiled French Emperor Napoleon III and Emperess Eugenie stay at the Brown’s Hotel. Their main residence of exile is Camdem Place outside London. Emperess Eugenie was considered the most elegant woman of her time, she owned of the Villa Eugenie in Biarritz, now the Hôtel du Palais and was the last Queen of France. • 1876: The inventor of the telephone, Alexander Bell placed the first UK phonecall from the Brown’s Hotel through the hotel owner’s private telegraph line. • 1882: Henry Ford (son of James John Ford) took over the management of the Hotel. Having lived in Canada, Henry Ford (no relation with the automobile manufacturer) introduces multiple innovations to the Hotel. One of them was electric light. • 1889: Brown’s Hotel purchased the adjacent St George’s Hotel. • 1905: Eleanor and Franklin D Roosevelts, later president of the USA, stay at the Royal Suite, later mentionned in the autobiography « The Lady of the White House ». • 1905: Three more houses on Albemarle Street are acquired. • 1914 – 1918: Belgian Queen Elisabeth stays at the Hotel during world war I. • 1924 – 1936: Royal Family of Greece lives for 12 years in exile in London. They stay at the Browns Hotel. • 1941: The exiled Dutch Government used the Brown’s hotel as their base. • 1968: Acquisition of the Hotel by Thrusthouse Forte Brown’s Hotel later became of the 21 « Exclusive Hotels by Forte », the top segment of the conglomerate including 800 Hotels, from the most luxurious hotels to the most economical roadside inns. • 1997: Brown’s Hotel is sold to Raffles, the owner of the legendary Raffles Singapore. 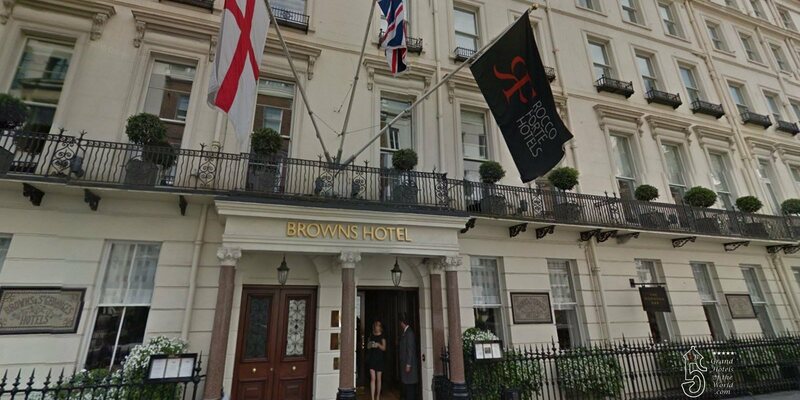 • 2003 July 3: Brown’s Hotel is bought by Rocco Forte Hotels for £51.5m (see also 1968). • 2005: Reopening of the Hotel in the RF Hotel Chain. • 2012: The Hotel celebrates it’s 175th birthday. • 1997 February: Opening of Balmoral Hotel in Edinburgh..
• 2003 July: Acquisition of Brown's Hotel in London. • 2006 March: Opening of Ville Kennedy (Villa Speyer) in Frankfurt. VB.com and on Grand Hotels of the World.com.